If you manage a successful business, you have probably run into more than one occasion where you were concerned about your security. Having cameras and a security surveillance system is already taking a huge step in the right direction. Security cameras are critical in identifying criminals, and you know how important these are if you have had break-ins in the past. But what else are you doing to prevent break-ins? Besides having a security system to catch criminals in the act, are you using any preventative measures that would dissuade someone from breaking into your business or office building? An electronic gate opener provides a higher level of security for your business. There are many benefits to getting one installed. It is one of the most cost-effective and hassle free ways that you could be protecting your business. Business owners might believe a gate opener costs too much money. However, gate openers are not as expensive as you think. With all of the options that you have for different functions, styles, and grades of door openers, you don’t have to buy the most expensive, top-tier gate opener. Simply having one in place is going to protect your business, and could save you money in the long run by preventing theft of equipment and inventory. By simply having an electronic gate opener outside of your business, intruders and potential thieves will be deterred from trying to trespass on the premises. Having a visible, high-tech gate outside a business is going to bring fear to any potential intruders or loiterers. A gate opener will ensure that only your team and the people that you trust will have access through your gate, during the hours of your choosing. The other beneficial aspect of having a gate opener is the level of customization that you get when you are installing your gate. With the keypad and security permissions each gate allows, you will be able to change codes on your own, and grant access through the gate. As a result, you can be as selective and protective as possible by only giving access through your gate to your team members, partners, and stakeholders that you trust the most. Another perk to adding an electronic gate opener to your business is it adds a higher level of perceived value to the look of your business or your building. Whether you have clients visiting from out of town, prospective clients are taking a look at your facilities, or investors are coming back to take a look at your business, having an electronic gate gives your business an elevated look. It makes it look valued and important. Plus, added security shows you and your team value your business and keep safety in mind at all times. What’s great about gate openers unlike other forms of entry is that they are almost entirely silent. If you are used to having squeaky hinges or boisterous garage doors or warehouse gates, you will be pleasantly surprised at just how quiet these gates are. That way, you won’t be a disturbance to your business team or the other businesses or homes in your area. 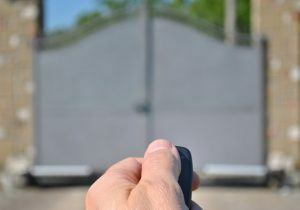 One of the top reasons that you should consider investing in a gate opener for your business is so that you can protect the things that are the most valuable to your business. Running a business requires equipment and inventory that allow you to make your business work and are the means through which you make your living. If you aren’t protecting your inventory and your equipment, you are putting your business in danger. Even if you have an emergency fund that you can dip into in case you would have a piece of equipment get destroyed or stolen by an intruder, wouldn’t you rather save that money for another time? Investing in a gate opener will not only protect your assets, but it will also protect your money and your business savings. Something that is of the utmost importance to you as a business owner is protecting your team. Making sure that your employees and team members are safe should be one of your top priorities, and if all that takes is having a gate opener in place, it is well worth the investment. Contact a local professional to determine what type of gate opener is right for your business. A pro provides useful security advice and installation to keep your premises safer. Thank you for visiting our blog! How can we help you? Contact us today.